Thisstory was updated at 6:25 p.m. EDT. WASHINGTON ?-NASA has selected Lockheed Martin as the prime contractor to design, developand build the OrionCrew Exploration Vehicle (CEV), the planned replacementfor the space shuttle thatwill become the backbone of the agency's human spaceflight program. LockheedMartin beat out a rival bid from Northrop Grumman and Boeing to win a contractNASA said would be potentially worth $8.15 billion. NASA madethe long-awaited announcement Aug. 31, ending an intensecompetition whose roots go back to 2004, when U.S. PresidentGeorge W. Bush called for the development of a CEV to replace thespace shuttle and eventually carry astronauts to the Moon. "The competitionwas fierce and the proposals were strong," Doug Cooke, NASA deputy associateadministrator for exploration systems, said during an Aug. 31 press conferenceannouncing the selection. NASA Administrator Mike Griffin briefed industry CEOson the decision at approximately 2:30 p.m. that day. JoanneMaguire, executive vice president of Lockheed Martin Space Systems Co. inDenver, said company employees were "humbled and excited" by the award. "Workalready is under way and we are fully focused on the vital tasks that lie aheadto meet NASA's requirements for the program," she said in an Aug. 31 newsrelease. LockheedMartin's stock, which opened the day at $81.85 a share and spent the morningtrending downward, abruptly began rising just after 1:30 p.m. The stock closedat $82.60 a share, then rose in after-hours trading to $84.10. NorthropGrumman's stock, meanwhile, had been climbing throughout the morning until justafter 12:00 p.m., when the advance turned into a mild retreat. North Grummanopened at $66.84 and closed at $66.81, then dropped to $65.40 in after-hourstrading. "Clearly,Northrop Grumman is disappointed by today's announcement," Northrop Grummanspokesman Randy Belote said in an Aug. 31 telephone interview. "Orion is,however, merely the first of many significant space systems required to enableroutine human space exploration beyond low Earth orbit. Northrop Grumman andits teammates are already helping NASA define the requirements for futureelements and Northrop Grumman fully expects to play a significant role in thedevelopment and production of those systems." NASA saidin an Aug. 31 press release -- that went out even before the winner wasannounced during the press conference at agency headquarters -- that the initialcontract is structured into separate schedules for design, development, testingand evaluation (DDT&E). The contract for the initial part of the project,known as Schedule A, is slated to start Sept. 8 and run through Sept. 7, 2013.Agency officials said that initial part of the contract would be worth $3.9billion. Thecontract also contains options for production of additional spacecraft andsustaining engineering. If fullyexercised, the options contained in Schedule B would be worth another $3.5billion. The options for sustaining engineering contained in Schedule C couldbe worth as much as $750 million. NASA saidmanufacturing and integration of the vehicle components will take place atcontractor facilities across the country. LockheedMartin will perform the majority of the Orion vehicle engineering work atNASA's Johnson Space Center, Houston, and completefinal assembly of the vehicle at the Kennedy Space Center, Fla. All 10 NASAcenters will provide technical and engineering support to the project. LockheedMartin Space Systems announcedearlier this year that if it won CEV, it would run the program fromHouston, bringing 1,200 new jobs to the area. LockheedMartin has long dominated NASA's robotic planetary spacecraft business and nowhas the opportunity to do the same in humanspaceflight. LockheedMartin's major Orion teammates include: United Space Alliance of Houston, thejoint venture of Lockheed Martin and Boeing that operates the space shuttle;Orbital Sciences Corp. of Dulles, Va.; Honeywell Defense and Space ElectronicsSystems, Minneapolis; and Hamilton Sundstrand of Windsor Locks, Conn.
NASA saidpost-development spacecraft delivery orders could begin as early as Sept. 8,2009, and run through Sept. 7, 2019, if all options are exercised. The agencysaid the estimated value of those orders will be negotiated based on futuremanifest requirements and knowledge gained through the DDT&E process. Sustainingengineering work will be assigned through task orders. That work is expected tooccur from Sept. 8, 2009, through Sept. 7, 2019. "DuringDDT&E, NASA will use an end-item cost-plus-award-fee incentive contract.This makes the award fee subject to final determination after the contractorhas demonstrated that it meets the technical, cost, and schedule requirementsof the contract," the agency said in its release. Orion willbe capable of transporting four crew members for lunar missions and latersupporting crew transfers for Mars missions, NASA said. Orion also will be ableto carry up to six crew members to and from the international space station. The firstOrion launch with humans on board is planned for no later than 2014. A humanMoon landing is expected to occur no later than 2020, the agency said. 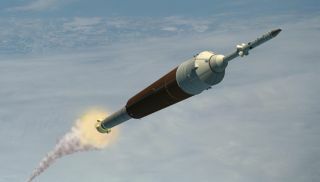 Caras"Skip" Hatfield, NASA's Orion project manager, said that the current plan forthe spacecraft's landing includes a primary land-based touchdown, with a waterlanding as a back-up option. But that decision is not finalized at this point,he said. "We're assessing and making sure that's the right answer," he said. Hatfieldsaid NASA is still determining what portions of the Orion spacecraft will bereusable, but noted that the heat shield that protects the vehicle duringatmospheric re-entry will always be replaced after each flight.